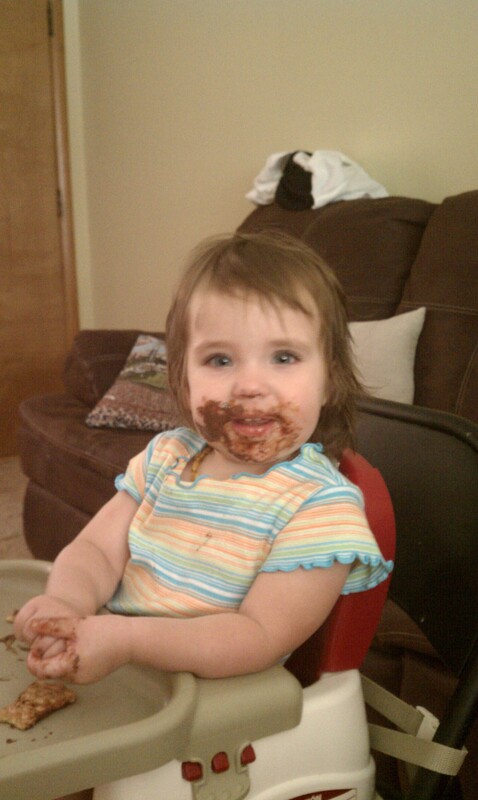 My name is Lori, and I’m a chocoholic. Make no mistake though, I am not looking to give up my habit anytime soon. However, in the interest of wanting to get in better shape and lose some weight, I realize that my chocolate habit might just need a little attention. Now, I’ve never been one to binge on chocolate. I’ve never been able to sit down and eat an entire chocolate cake or a whole pint of Ben & Jerry’s Phish Food ice cream in one sitting. Heck, even trying to polish off a King Size candy bar makes my stomach hurt. However, I am the type that needs a little chocolate fix every day or I get a little agitated. I don’t know how I managed to go 30 years without ever trying this stuff. Okay, so maybe I do. I remember seeing the jars on the grocery store shelves and turning up my nose. Hazelnuts? Gross. (At least I always thought they were). Chocolate spread in a jar? Gotta be nasty, right? 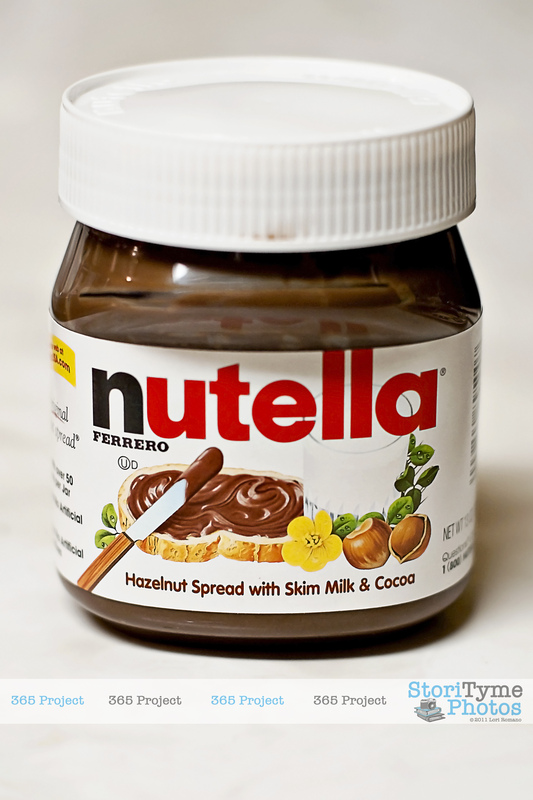 Created by Italian pastry maker Pietro Ferrero in the 1940’s as an alternative to traditional chocolate which was in short supply during WWII, Nutella has enjoyed great success and popularity, and is sold in over 70 countries today. 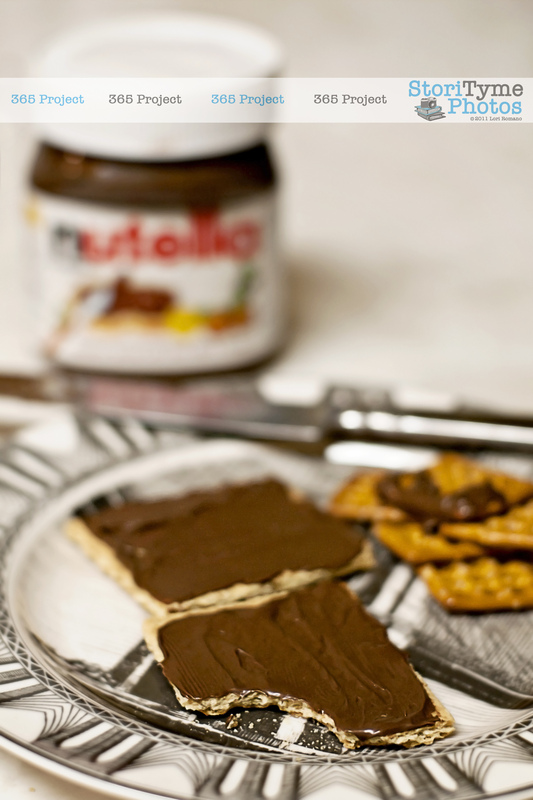 This smooth, creamy hazelnut spread is a healthier alternative to regular chocolate, and is every bit as delicious. Even a die hard chocoholic like me can be perfectly happy choosing Nutella to satisfy a chocolate craving. Skeptical? I dare you to try a bite and see if it doesn’t change your mind. It wasn’t until my sister Whitney offered me a bite of a graham cracker with some Nutella spread on top that I finally got up the nerve to try it. 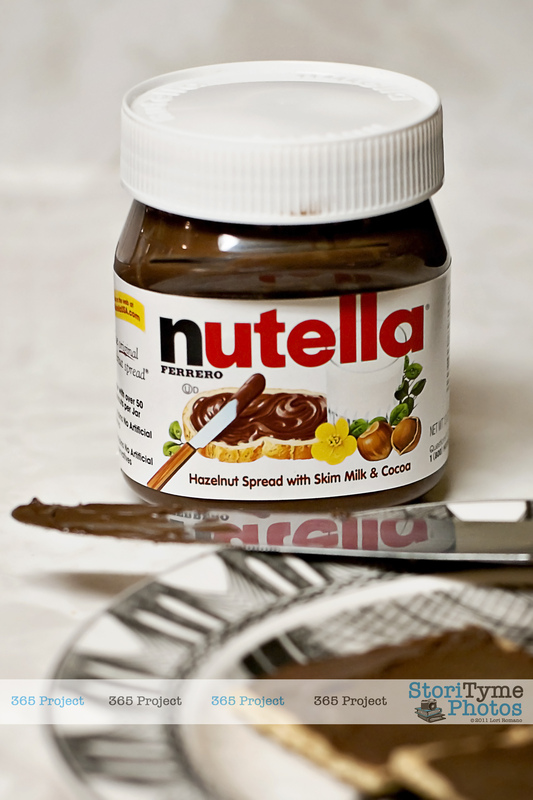 Oh Nutella, where have you been all my life? 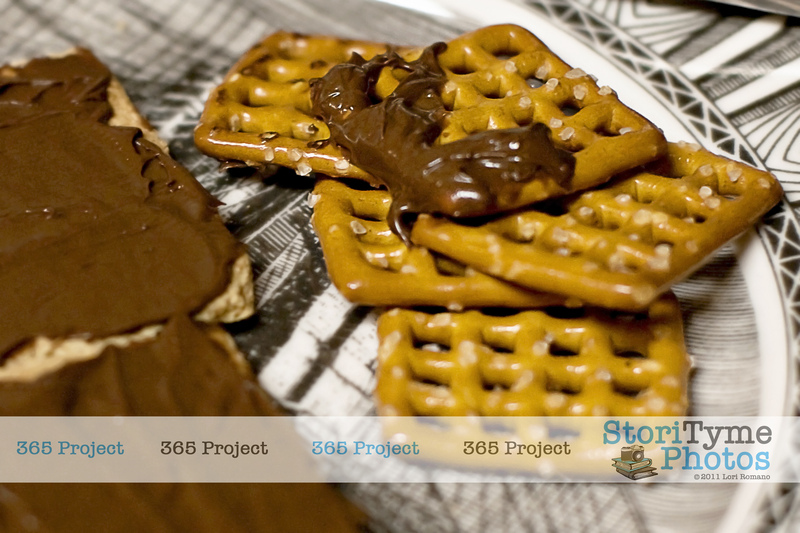 Tonight’s 365 Project is dedicated to Ferrero’s exquisite creation–Nutella. Mmm…Nutella. Too funny that you just tried it — a few years ago my hubby and I went to Germany and the hotel had Nutella on its continental breakfast spread. The other girl in our group was like, “Oooh, Nutella!” but I just assumed she knew about it because she travels to Europe a lot. So I tried it on an apple and was like, “Whoa, yum, why don’t they have awesome stuff like this in America? !” Um, clearly I was the only one at the table who was out of the loop. Also — I didn’t know it was made by Ferrero until I read your post. That makes it even worse, because I literally lived FIVE BLOCKS from the Ferrero distribution center at the time! ha! Dude! You could have been eating that stuff like it was going out of style! Very interesting! I’ve heard of it, but didn’t think it could be as good as the real thing. I guess I’d better bite the bullet and give it a try. You definitely have to try it Mom! You won’t be disappointed!